Yes, Teyani, the wisteria is blooming! And now that the scarf is finished, I can move on to the Cactus Rose shawl without interruption! Well, at least until I have to clean up and pack to go away for the weekend. 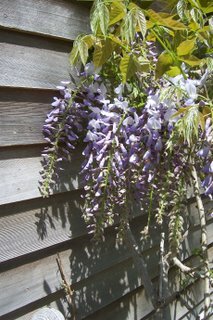 I just love wisteria don’t you? Will I see you tomorrow night? I love your accidental shawl. That could be the name of a movie. Also, IF you can knit the sand shapes, please let me know. Wow!Gorgeous wisteria, too. Sniff sniff… sigh.. I am living vicariously through your beautimus photo… wish I was there..I think we should rendevous at Rhinebeck.. I’m already planting seeds of such a grand meeting all over my favorite blogger’s sites.. we could find a wonderful little hotel close by and meet up and knit and laugh til dawn!Thanks for the great photo Jane.! My wisterias are also blooming! It’s a wonderful time of year. 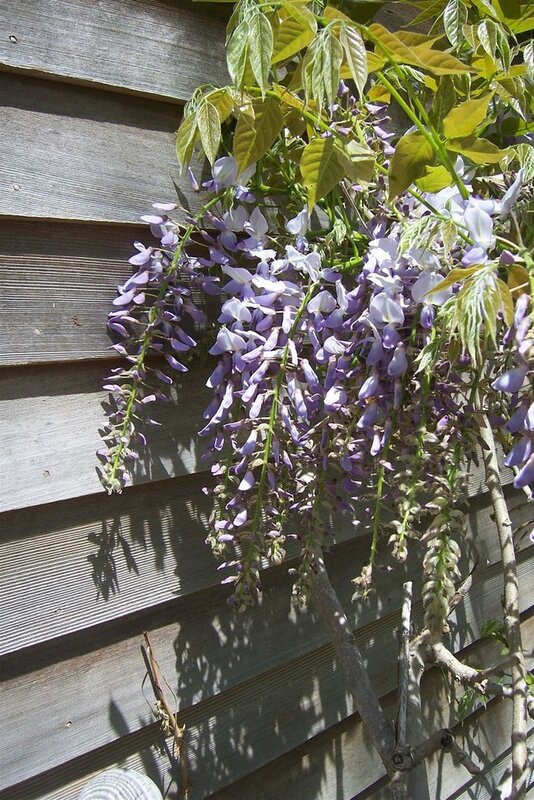 My Dad has a lovely wisteria draped around his patio, but in Australia at the moment it is Autumn (fall) so the poor thing is not looking at it’s best.